For the week the Comex closes show the GOLD PRICE 4.1% lower and SILVER 2.3% lower. Look at the end of day chart and you’ll see they in fact closed higher this week. Stocks are swimming in deep waters wearing concrete boots. Dow lost 2.9%, S&P500 lost 2.2%. What happened to the Greece- relief rally? It became the no-profits plunge. 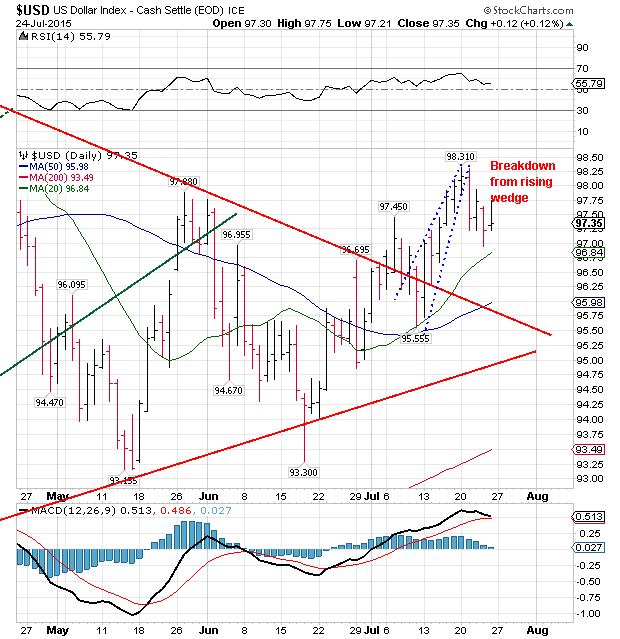 US dollar index turned down this week, at least for a while. My grandfather actually said, “I don’t mind it when they spit on me, it’s when they rub it in that I get mad.” That’s how I felt watching silver and gold prices today. Here’s the conundrum: Once upon a time the open outcry market on Comex was the only game in town after the London fixes. Several years ago Comex began offering the computerized Globex market after Comex’ meager hours (8:30-1:30 Eastern), and silver and gold trade now around the world 24 hours a day. This year Comex ended the open-outcry floor. These changes make taking one number — “the Comex settlement price” — problematical. Does that really reflect the price, or was that where the traders manipulated it for the close? Everybody knows that “somehow” on options expiry day silver and GOLD PRICES miraculously slip, relieving options sellers of having to pay off on in the money options by making them out of the money. Ya’ll write this down so I can remember it: Comex gold and silver futures contract options expire on four days from the end of the month, unless that’s a Friday or before a holiday, when it’s moved back a day earlier. That makes next Tuesday options expiry day. Now this would be a puzzle whether I suspected markets were manipulated or not. Which price is the most representative price, Comex close or End of Day? Today was a rare example of one gainsaying the other. Silver and GOLD PRICES opened lower in overnight trading. Silver hit a low about 9:00 at $14.43, bounced, then made a slightly lower low at $14.33 about 11:30. From there it climbed the rest of the day, but somehow or the other the Comex tape was painted with a LOWER close for silver, down 20.6 cents at $14.477 and a LOWER close for the gold price, down $8.40 at 1,085.60. These ain’t minor differences. In the aftermarket the price of gold was trading $15 (yes) higher at 1,100.50. Silver was trading 24.3 cents higher at $14.72. Well, which is it? Which price is the “right” price? So the end of day (EOD) charts I always show y’all will today plainly reveal key reversals. Here’s gold on the right. Here’s what I like about that chart. Not only does it show that first half of a key reversal, it also shows an oversold RSI become LESS oversold, and typically the low price occurs a day or so after the RSI low. 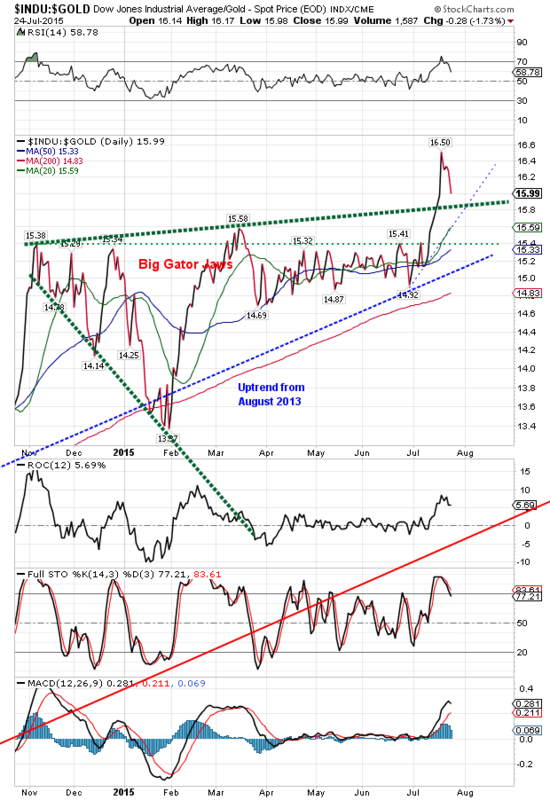 The MACD also wants to curve up, and the rotten Rate of Change has turned up. Full stochastics are trying to turn up. Volume rose very strongly today, and was almost as high as that on Monday’s plunge. Now look at the silver chart. There’s that first half key reversal today. Volume shot up nearly to Monday’s level. The RSI was oversold only one day (20 July) and has crept up since. MACD needs only one good up day to turn it up. Rate of Change has already turned up, and full stochastics want to. Is all that an ironclad case for a price reversal? Not at all, but it does resemble previous big reversals. Price will tell on Monday whether that’s the right interpretation or not. What about the GOLD/SILVER RATIO? 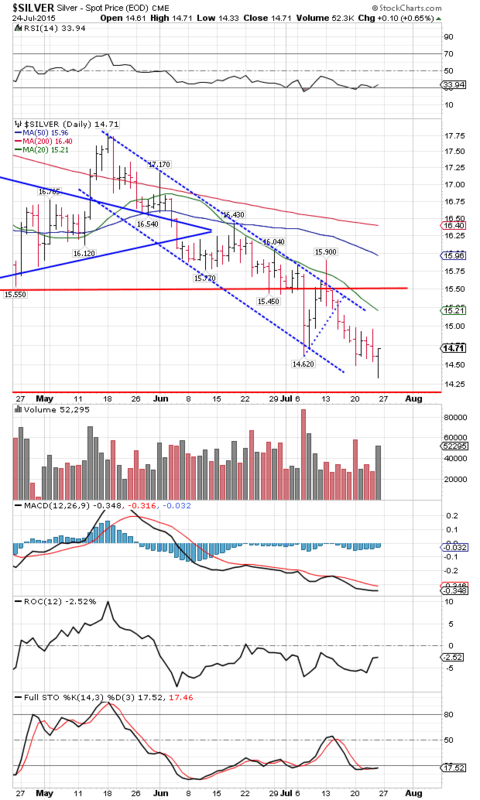 Rose 0.64% to 74.988, but remained below the 20 day moving average and the uptrend line from the April 2011 low. All indicators point to a lower ratio. Stocks opened the day bleeding and it turned out during the day it was an artery. Dow lost 163.39 (0.92%) to 17,568.53. Where does that put it? In negative territory for 215 by 415 points. Below the March, April, May, and June lows, but not yet July’s (17,466). Below the 200 DMA (17,568.53), not to mention the 20 and 50 DMAs. 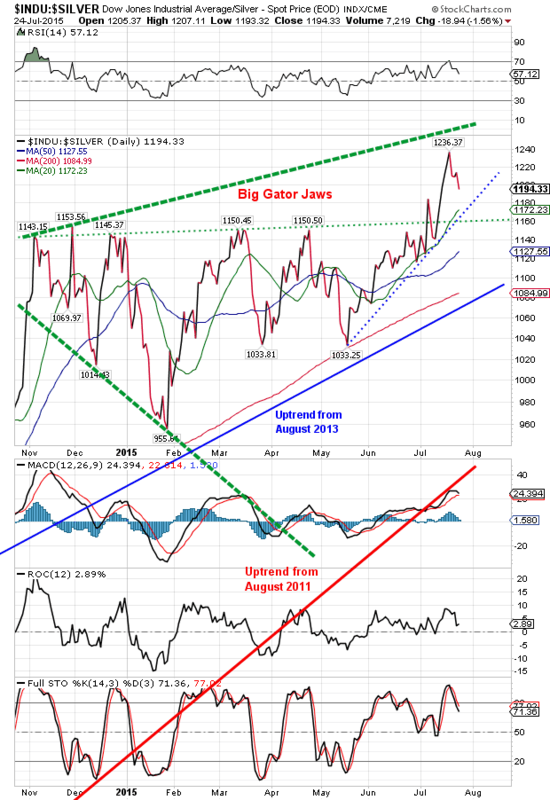 MACD and RSI have turned down. All waypointers point down, and a close below 17,400 adds jet fuel to the fall. Y’all look for yourselves chart on the right. S&P500 shaved off 22.50 (1.07%) to 2,079.65. 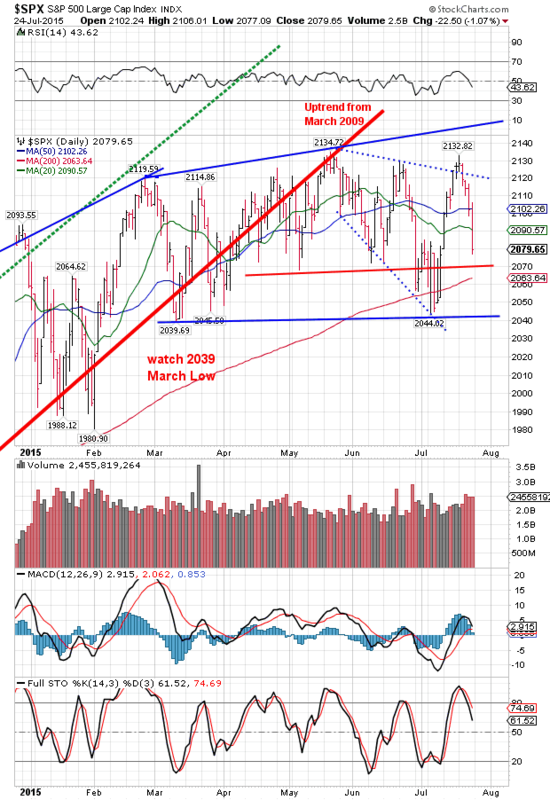 It hasn’t crumpled as badly as the Dow; it remains 20.75 above where it ended 2014, but has plunged below its 50 and 20 DMAs and pointed toward its 200 DMA (2,064). I’d say they’ve turned down, but the S&P500 needs to cut through its 200 DMA to confirm that. 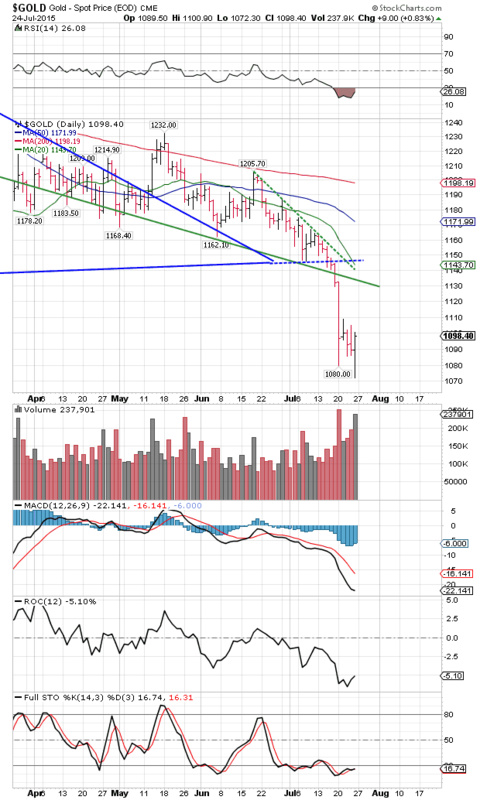 I ain’t a bit ashamed or embarrassed to show the Dow in Gold and Dow in Silver charts. DiG shot up in response to Greece-relief, and has shot down just as fast. Closed the week at G$330.54 (15.99 oz) and falling. Dow in Silver fell this week to S$1,544.18 silver dollars (1,194.33 oz). Indicators have turned down. US dollar index rose 12 basis points to 97.35. Correcting the previous rise. 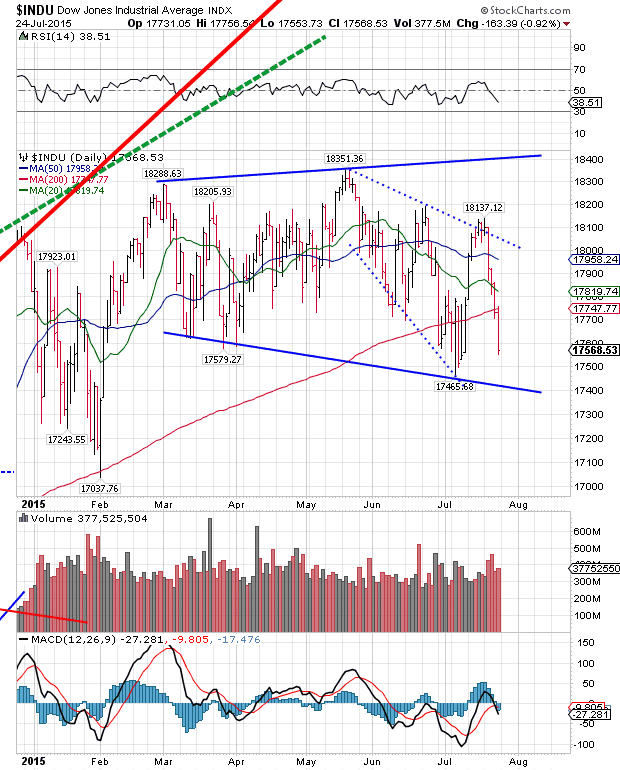 Might start rising again next week, but indicators are trying to turn down after it fell out of a rising wedge this week. Euro flaked again today, down 0.8% to $1.0978 on its way to par with the dollar. Yen rose 0.05% (does that really qualify as a rise?) to 80.76 cents/Y100 (Y123.82 = US$1). Is anybody watching?